Our new "Jump!" 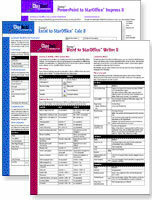 ClueSheets quick reference cards are specifically designed to help individuals or organizations quickly migrate from Microsoft applications to StarOffice 8 applications. Generously discounted general SITE LICENSES for electronic distribution (and 'extended' licenses for product bundling purposes) are readily available to all organizations and workgroups. Special site license pricing is offered to educational and non-profit organizations. Please don't hesitate to ask us for a site license price estimate tailored to your organization and budget. The Jump! ClueSheets are specifically designed to help individuals and organizations migrate from Microsoft Word, Excel, and PowerPoint, to StarOffice 8 Writer, Calc and Impress respectively. Jump! ClueSheets offer an attractive alternative to buying, searching through, reading and storing massive documentation manuals for Both Microsoft and StarOffice applications. Jump! ClueSheets offer an attractive alternative to opening and searching through the online-help systems and clicking back and forth between the help and document screens. Jump! ClueSheets are developed by daily users of StarOffice and OpenOffice.org software applications who are experienced information designers, technical writers, and documentation specialists ... and need to make the jump to StarOffice/OpenOffice. Org applicatons suites as quickly and painlessly as possible. The Jump! ClueSheets are available in complete sets of 3 only and are immediately downloadable from this website as .PDF files. For step-by-step instructions on how to perform specific selected tasks in the varioius StarOffice applications, see the StarOffice ClueSheets. Click on a title below to see a list of contents for that Jump! ClueSheet. When you download your ClueSheets quick reference cards, they will come to you in PDF form. You will need Adobe Acrobat Reader version 5.0 or later to open, read and/or print your ClueSheet.